The Relax With series is a relatively new collection of piano music books edited by British concert pianist Samantha Ward (published by Schott Music) and designed primarily to be played at home, simply for pleasure. Selected for their relaxing qualities, the pieces in this volume range from well-known classics to delightful lesser-known gems. Featuring both original pieces and some arrangements, these books consist of volumes dedicated to the Baroque, Classical and Romantic periods, as well as the French Impressionist composers and traditional music from around the world. The collections are of approximately late elementary to early advanced level, but a competent amateur pianist will have little difficulty in mastering the pieces. ‘Mindfulness’ has been a popular (even fashionable) topic in music (and other subjects) over the past couple of years, and these publications focus almost exclusively on this concept. The books are beautifully appointed and printed (as might be expected of Schott), and each one contains a wide variety of repertoire within the context of the various titles. Whilst these books are no doubt a rewarding collection to learn, I feel they would also serve as excellent sight-reading material for the advanced player. There are five books (pictured above) to giveaway this weekend to five lucky winners! So leave your comment in the comment box at the end of this post to be in with a chance of winning. I will announce the winners on Monday evening (British time). Good luck! To find out more about this series and to purchase books, click here. It’s at this time of the year, before the new term starts, that I spend a lot of time casting around for fresh material for my pupils. These books look particularly interesting, especially Folk Piano. I would be more than happy to have these books. I am sure the muisc is lovely and one can discover less known music from different composers. Besides Shott’s printed music is always of exceptional quality. I love the fact that the books span the periods and genres. At a glance this can become a music history lesson as well as you pointed out Melanie a sight-reading exercises in some cases. A fab asset to any teachers library! These look great – I’m working on my own sight reading skills so combining that with relaxation sounds ideal. Fingers crossed for a win! Wow… interesting. Good collection for music lovers. What a wonderful collection. I think I’m in love… Having any one of them would be wonderful. 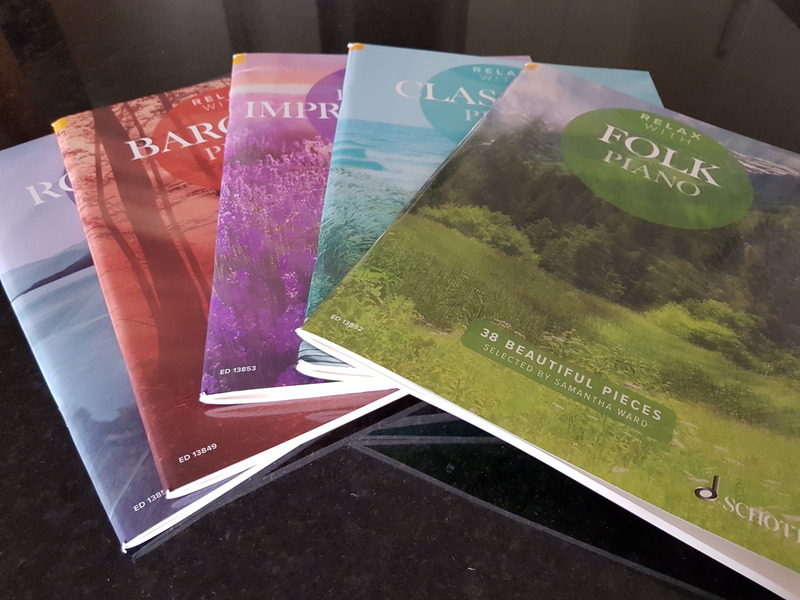 A great collection of books to use as sight reading and for personal enjoyment. I’d love to win one if these. What I gift this would be to me as a piano teacher! I’ve found that that the more I myself practice, the better teacher I become – these books would be a wonderful way for me to prepare for next term! As an adult that started the piano at 53 I’m always looking for new pieces to learn. This series sounds wonderful…probably a little challenging but that’s good. Ooh, I’d love a relaxing sightreading session…! I would love to win this for my studio! All my students love this type of music! Great collection. I would like to play some of them. Greetings from Colombia! I look forward to exploring these books. I have adult students who would truly enjoy this series. It’ll take more than a new piano book to relax me at this stage in the term but I’m willing to give it a go! These books would be really useful to me in my teaching at school and at home. I often need new pieces to encourage my students, especially after exams! They would be wonderful for playing over the school holidays. Thanks for the opportunity, Melanie! I’m very interested in these beautiful books filled with lovely music just waiting to be played and shared with everyone!